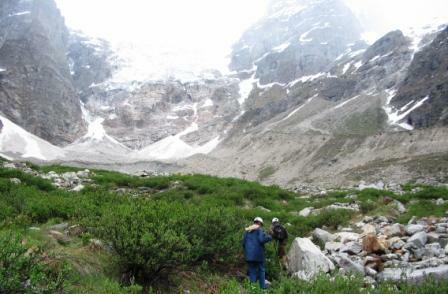 The following are popular GHNP trekking routes have been trekked by Park staff with foreign visitors. Other routes may be explored, but visitors must check with Park officials for entry and route permits for obvious safety reasons. A five day trek crossing through the Sainj river valley. Day 1: Neuli (1500 m altitude) to Shakti (2100 m altitude). Day 2: Shakti to campsite at Lower Meadow Bridge in Homkhani Forest (2800 m). Moderate through dense forest, walnut trees, medicinal herbs, etc. Shakti village (left) and Sainj river near Shakti. Day 3: Rest Day at lower Meadow. Day excursions. Day 4: Return to Shakti. Day 5: Return to Neuli. Total Distance: 56 km (round trip). 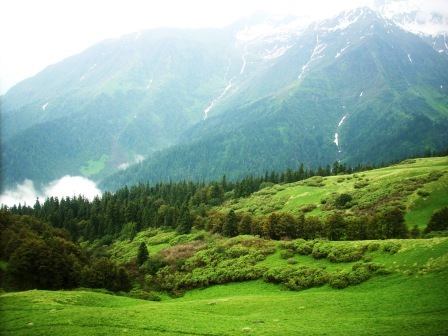 To Dhel (3737 m)- heavy moderate through dense forest up to beautiful high and wide meadow. Great vistas and opportunities for observing wildlife. Distance: Neuli to Dhel round-trip: 66 kms. A eight-day trek crossing two valleys. Moderate to strenuous. Experience the transitions between two magnificent valleys. 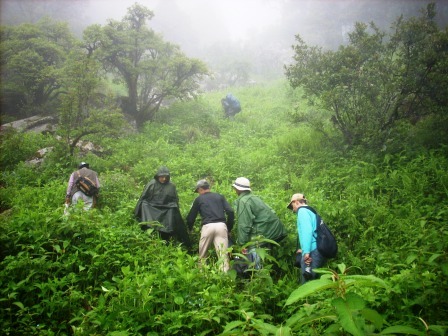 Heavy-moderate ascent through dense forest, walnut trees, medicinal herbs, etc. Dhel Meadow at 3737m alt. A paradise for both botanist and zoologist. 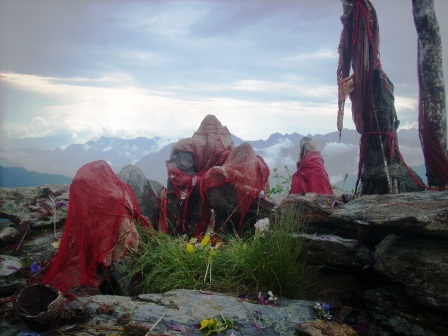 The deity of Kali is worshiped on the top of Dhel ridge. Grand view of Himalayas from the Dhel Meadow. Distance: 4 to 6 kms. Guntarao Meadow with verdant nature and many diversity plants and animals. 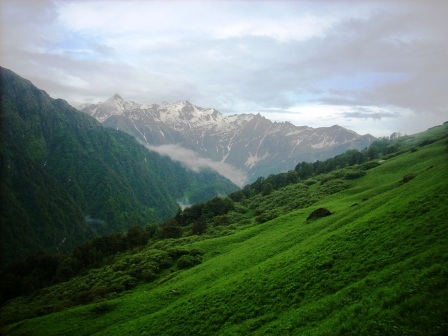 A botanical expedition covering both Sainj and Tirthan Valleys. Flora of the Great Himalayan National Park has been published in a book form. 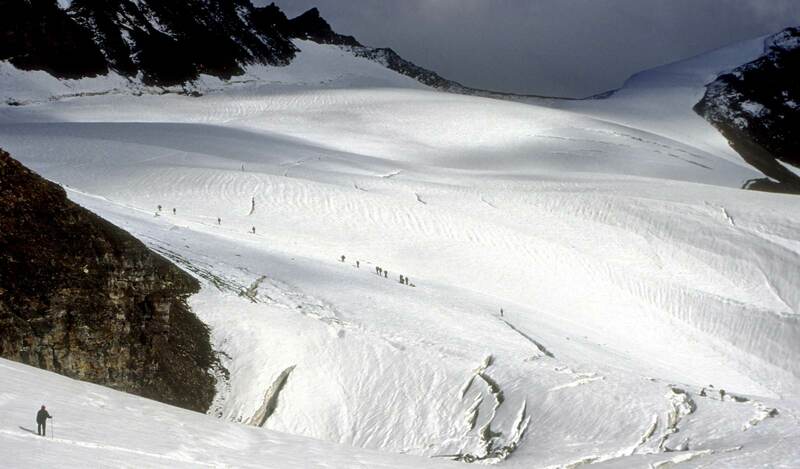 An ice bridge or two may have to be negotiated on Tirthan side of this trek. Day 7: Guntrao to Shilt (3100 m). Moderate up and down. Lush bamboo forests, streams and waterfalls. Shilt campsite offers opportunities for evening wildlife. Easy to Moderate three day hike from Ecozone into Park. Day 1: Gushaini (1500 m) to Rolla (2100 m). Entry into Park. Easy day. Day 2: Rolla to Shilt Hut (3100 m): side trip to Chhordwari waterfall and bamboo forest. Distance: 7 kms. Day 3: Shilt to Gushaini: Return. 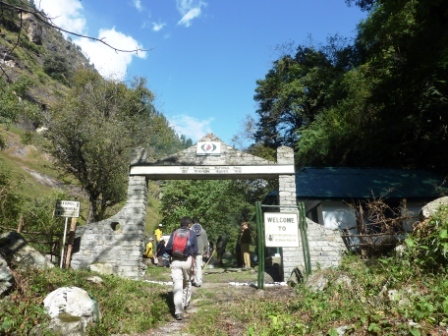 GHNP Entrance gate in the Tirthan Valley. A seven-day, very strenuous, dramatic hike crossing the mountain passes at Kandi Galu (3627m), and Phangchi Galu (4636m). Incredible vistas. Must be in excellent physical condition as very demanding with elevation ascent of 2000 meters and 1500 meters descent in one day (total up-down, 3,500 m in one day!). 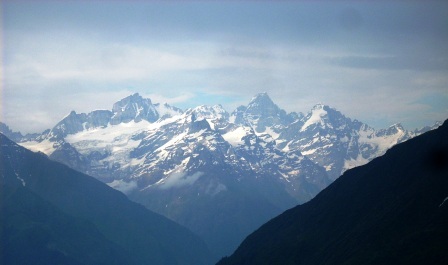 (2200 m). Evening at village school site. Moderate ascent. Distance: 23 kms. Day 2: Bhagi Kashahri to Subli (3300m). Strenuous ascent in early morning (3600 m). Pass through Kandi Galu notch (3627m). Distance 17 kms. Day 3: Subli to Dwada (3150m). Relatively easy hike passing through birch forests and meadows. Distance 6 kms. Day 4: Rest Day at Dwada: Beautiful meadow surrounded by steep mountain valleys and flowing Jiwanal River. Peaceful and good place to rest after long hike from Subli. Day 5: Rest Day Dwada: Day hike up to Surtu Glacial Pond in Khandedhar with dramatic mountain backdrops. 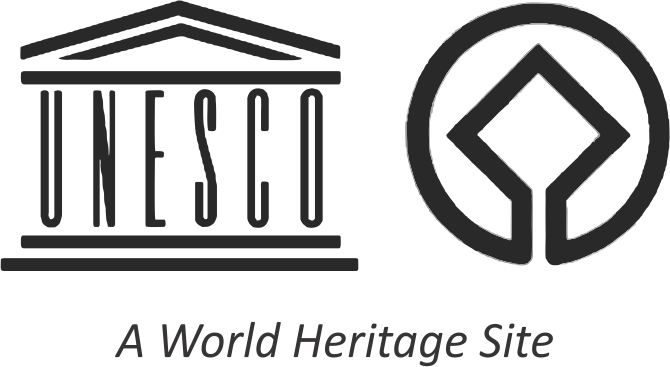 Opportunities for wildlife observation including Brown Bear, Snow Leopard, etc. Distance: 20 kms. round trip. Day 6: Dwada to Chippi (3550m): Very strenuous day. Crossing Phangchi Galu Pass (4636 m) below Khandedhar into Parvarti Valley. Continuous steep ascent over rock scree, boulders, and very narrow paths into high alpine meadows, then higher lichen environments. Can be cold and windy. 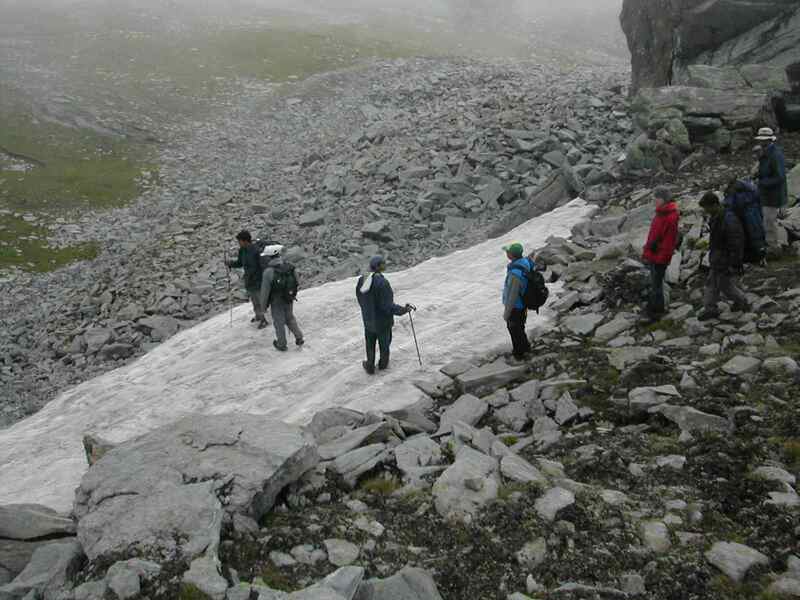 Descent from Phangchi Galu can have deep snow pack and should be done with great care as steep drops and potentially very dangerous. Sublime peace at the higher elevations. Stressful on knees coming down! Distance: 23 kms. Day 7: Chippi to Pulga: Easier descent back into forests and meadows, ending at village of Pulga. Distance: 18 kms. A beautiful hike with many habitat transitions. 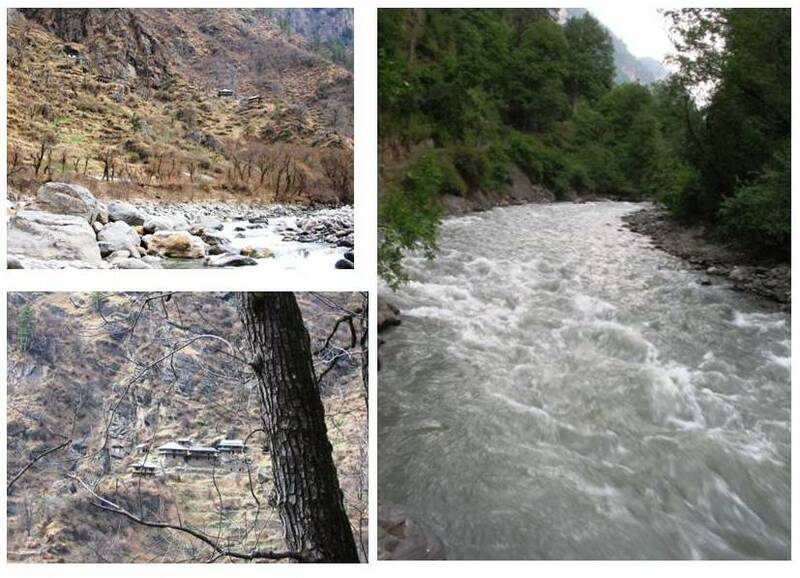 Tirath, the origin of the Tirthan River is a pilgrimage site for the local community. Moderate to strenuous. A trek to the source of the Sainj River. Moderate to strenuous. Day 2: Shakti to Parkachi (3000m) thach. 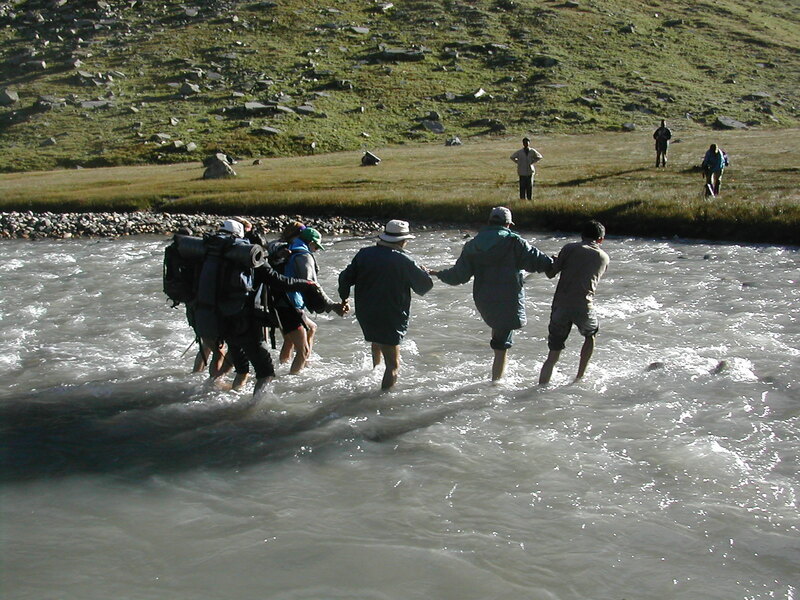 Trek along the Sainj river. Gradual ascent. Distance: 10 kms. Day 3: Parkachi thatch to Rakti Sar (4500 m): Along the river, quite a strenuous ascent through rocky portions. Crossing of streams along the route is tricky. Distance: 14 kms. Day 4: Trek from Rakti Sar to Parkachi thatch. Strenuous descent. Distance: 14 kms. This is a very strenuous trek to Rakti Sar. 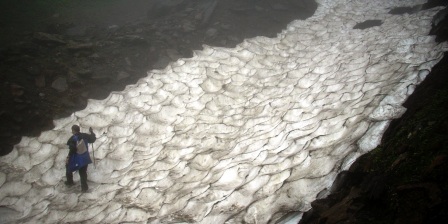 The melting snow causes rapid changes in the course of the Sainj river. Day 5: Rest day at Parkachi. Bird watching. Medicinal herbs. Day 6: Parkachi thatch to Shakti village. Gradual descent. Distance: 10 kms. Day 7: Shakti village to Neuli. Distance: 22 kms. One of the most spectacular treks in the Park crossing a high pass into Spiti. Moderate to strenuous. Must be in good shape and have a local guide for crossing the Pass. Main attractions: Village house architecture; tree deities; old Forest Rest House at Pulga; panoramic views; alpine and sub-alpine pastures; huge glacial structures at Man-Talai onwards; about 7 to 8 kms. long stretch of snow fields on the Pass; changing vegetation and distinct bird, mammal, butterfly life. 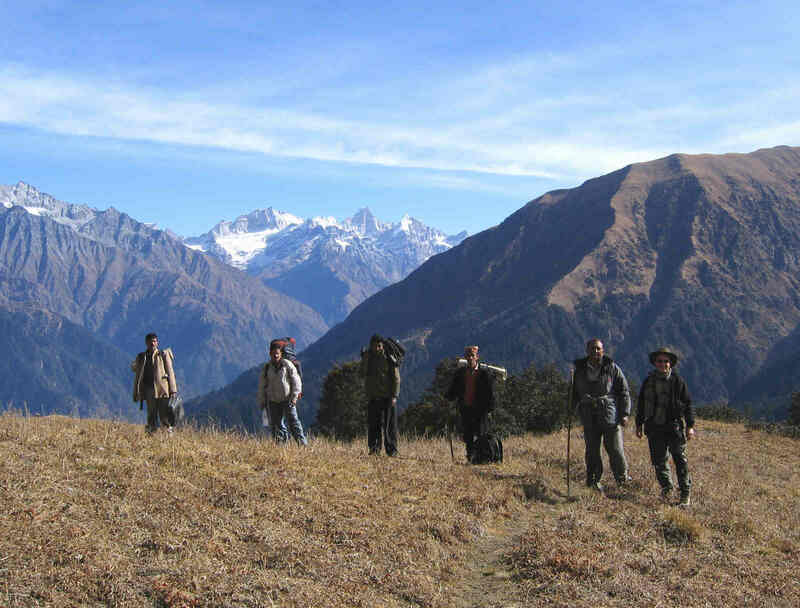 Trek from Barsheni to Khirganga (2960 m) Distance: 10 kms. A busy trekking route. The sulfur springs at Khirganga are very famous in the area. A number of Sadhus (holy men, hermits) can be seen camping in the vicinity of the springs. Day 3: Thakur Kuan to Pandupul (3700 m) to Mantalai (4200 m): This part of trek is above tree line in high altitude meadows full of medicinal herbs, alpine grasses, bees and butterflies during summer season. It should be done in two days: up to Pandupul in one day and next day to Mantalai. Distance: 20 kms. Day 5: Rest day at the base of Pass in Pin Valley. Day 6: Base of the snow field in Pin Valley to Tariya or near Mud: Trek through arid zone of the cold desert in Pin Valley. The arduous part of the trek is over, but watch out for crossing of streams on the way. 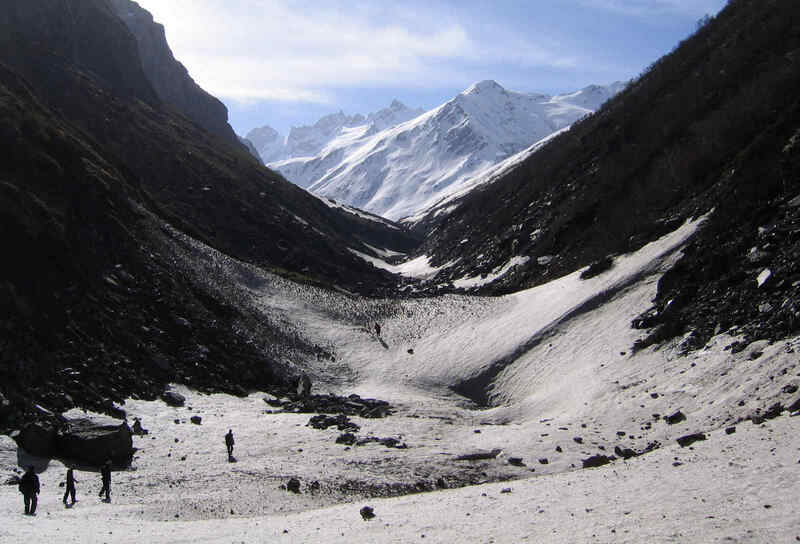 This part of trek can be done in two days with a stopover in between. Distance: 11 kms. Day 7: Tariya/Mud to Maling road head onwards by road to Kaza (3600 m): Mud is the first village to come by. The trekker may hire a pony or one of the famous Chamurti bred Tibetan horses to ride up to the roadhead. Distance: 15 kms. Note: A trained guide is required to cross the pass.